UCSC-Guest is an open access unencrypted wireless network for guests requiring temporary access to Internet browsers while visiting UCSC. UCSC-Guest should not be used for university work involving student records or other sensitive or confidential information. UCSC students, faculty, and staff should always use the encrypted and secure wireless network eduroam or ResWiFi. 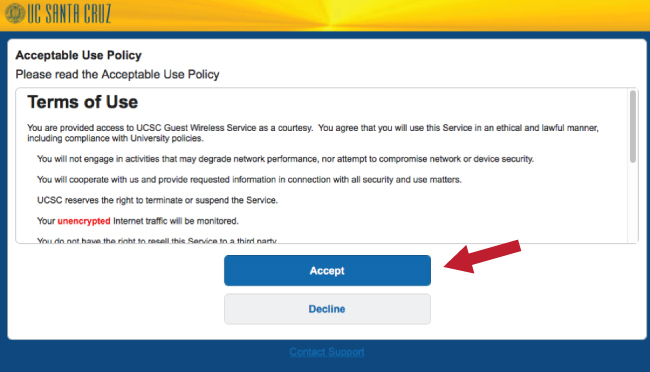 UCSC-Guest WiFi is subject to the rules and standards stated in the IT Policies and Guidelines. The person using UCSC-Guest owns the responsibility for what is done while signed in to the service. Select UCSC-Guest from the list of available wireless networks. Once selected, a sign on screen will appear. Click on the Guest Account link to obtain temporary username and password. Fill out the fields to create a temporary guest WiFi account and click Register. If you do not have a mobile phone or your cellular provider is not listed, please submit an online support ticket or call the ITS Support Center at (831) 459-4357 for assistance. 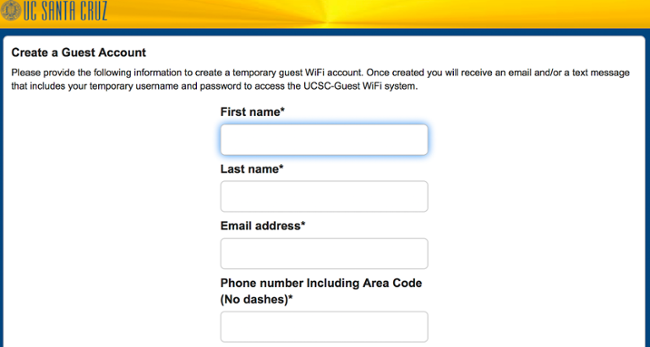 Once created you will receive an email and/or text message that includes your temporary username and password to access the UCSC-Guest WiFi system. Your access is good for for seven days. Enter your temporary username and password from the email or text notification and then click the blue Sign On button. 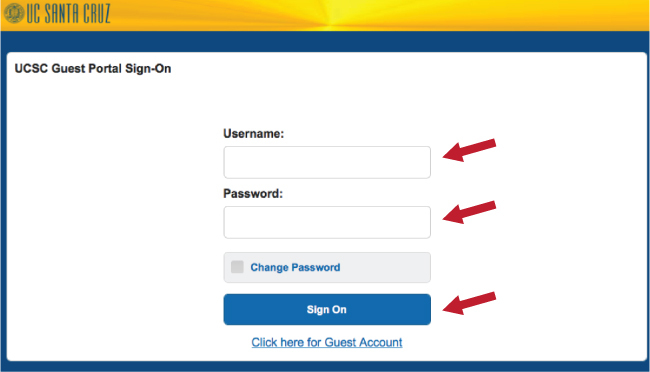 If you disconnect from UCSC-Guest network or delete/lose your temporary username and password, you will need to click the Click here for Guest Account to register again. Read through the Acceptable Use Policy and click Accept. Now you are connected to the UCSC-Guest WiFi network. Your access is active for seven days. If you need additional connection time, you may re-up access. 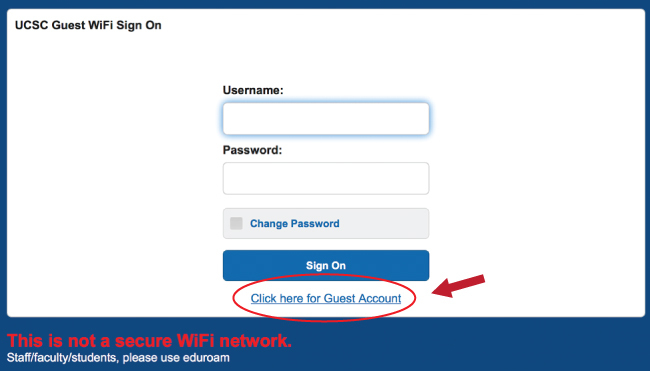 Once connected, by default, you will be taken to the UCSC eduroam Secure Wireless web page. If you need assistance using UCSC-Guest, please contact the ITS Support Center.